After going to annual expos, fairs, galas, parties, conferences, etc., year after year after year, this year was different. This year was transitional. The excessive bling and hype of yesteryear, designed to attract audiences, are no longer necessary. These events now have a steady, committed following. They have grown. They have graduated to the next phase – BUSINESS. Art Basel/Miami Beach, this year – the 15th anniversary – was quartered at the Miami Beach Convention Center (still under renovation and construction), where it displayed paintings and installations in more spread-out, buyer-friendly, exhibition halls. And to further the sophisticated impact of Art Basel, satellite shows popped up all over Miami Beach and Miami. Design/Miami housed handcrafted tables, chairs, lamps, sofas, beds, and household accessories to exquisitely decorate every room in your mansion. The Bass Museum of Art, known for its private collection, hosted exhibits installed by international artists seeking Art Basel exposure. Enormous tents pitched on the sands of Miami Beach and on the grounds of parking lots and vacant land in Miami, housed art from all over the world. Hotels emptied their rooms to make way for art galleries. 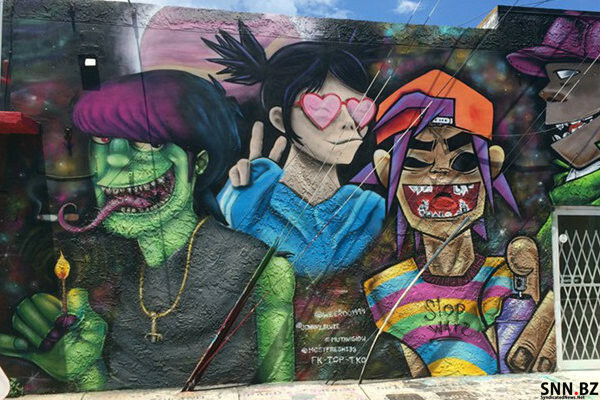 Muralists painted walls on buildings in Wynwood (Miami) where there were nightly free and open-to-the-public gallery and street parties. And, as they do every year, the Sagamore Hotel hosted a high-carb Art Basel Brunch. As usual, for the entire week, Miami buzzed with high-end art buyers, crafty art dealers, knowledgeable art educators, recognizable celebrities, and masses of tourists, visitors, and locals who immersed themselves in cultural activities and “who-saw-more” competitive banter. The Miami Book Fair at Miami Dade College started out as a small fair for the literary community. Now, celebrating its 34th anniversary, the Book Fair has grown to fill streets and streets with booths and book lovers of all ages. More than 400 authors were in town to network with the throngs of people who discovered the thrill of reading different genres, some even learning to appreciate Poetry, especially poems written by Richard Blanco, Poet Laureate at the 2013 Presidential Inauguration. And, NATPE (National Association of Television Program Executives) was in town, with a pre-opening party at the Eden Roc Hotel and a catered extravaganza the following night poolside at the Fontainebleau Hotel. During the day, Television Program Executives from all over the world held meetings where they bought and sold content for their media stations. Industry related presentations were led by experts in a variety of technical and social media fields. What changed this year was the set up in the Exhibition Hall of the Fontainebleau. No longer were there eye-catching, 3-D exhibits with colorful characters wandering around. Nor were there celebrity-sightings in the lobby. However, this year, Jane Fonda and Tom Selleck, and several other big names, were honored with the Brandon Tartikoff award at a fund-raising banquet. As I said, next phase … Business! Recovering from Hurricane Irma damage, A Taste of the Garden fund-raiser for the Miami Beach Botanical Garden, was a food fest where Stewart and I caught up with old and new friends. Another highlight of the season was the very successful second South Beach Jazz Festival. Thank you David New, founder of Power Access, Inc. (and Ability Explosion) for bringing Branford Marsalis and his wonderful band to the Colony Theater on Lincoln Road, as well as a season of pop up Jazz Bands on Miami Beach. Then th ere was Art Deco Weekend on Ocean Drive. More than 30 years ago, this annual weekend event was designed to draw attention to the beautiful Art Deco architecture on Miami Beach and the need to preserve it. What once was a small street fair with Jazz Bands, booths hawking Art Deco antique jewelry, and vintage car parades, now is a full week of tours, lectures, and a street fair like all others USA. Ocean Drive was jam-packed with smiling tourists, visitors and locals, all carrying bags with impulse items nobody needs, but must have. Even Stewart bought a straw fedora at the trendy hat stand.